Head coach Mario Cristobal has to be frustrated with the Oregon football team he inherited. Going into his first season, with a couple of all-stars on defense and a Heisman candidate quarterback leading his offense, it seemed that contending for the Pac-12 Conference championship was a goal within reach. Unfortunately, injuries and the collapse of both his defense and offense was not anticipated. The great progress of the defense from last year (4th in the conference) disappeared and the Ducks’ defense fell to 10th in the conference this season. The offense, always good for more than 28 points, slowed to a grinding, boring pace and was outscored in the first half of games the last part of the season 68-3. The ineptitude of the offense, which seems to be aligned to that of Alabama in the SEC, was alarming as it was clear Oregon did not have the horses to be a Tide, but the rest of the conference was not cooperating, either. In this video we see quarterback Justin Herbert at his best, throwing a 34-yard scoring strike to his favorite receiver Dillon Mitchell. This is a passing situation, one of many the Ducks were put in by only rushing for a minimal gain on first down. Mitchell gets separation from one of Utah’s best and most experienced corners and Herbert drops the ball almost straight down to Mitchell. On a long pass with tight coverage, the arc of the pass is very important. In this case, the steep trajectory denies the defender the opportunity of getting a hand on the ball. At times, Herbert does not get enough “air” underneath a long pass down the sideline; that opens it up to the defender having a chance to deflect the pass. This was a perfectly executed “long bomb” that cut Utah’s early lead to 13-7. Oregon defensive coordinator Jim Leavitt guessed correctly in this situation, something that he is called upon to do during the course of the entire game. Second-and-six is an either run or pass situation, but Leavitt figured the Utes were going to pass. First-game starter Jason Shelley threw for 262 yards and in this situation, he does not see Oregon cornerback Thomas Graham Jr. line up on the outside of the formation to his right, which would, for the experienced quarterback, be a sign of impending danger. Graham times his blitz perfectly, not allowing Shelley to set up and throw the ball and drops him for a loss of nine yards. An example of the perfect blitz situation: getting to the quarterback quickly and not allowing him time to spot an open receiver. The Ducks kill themselves on this early fourth-quarter drive down 22-7. Out of eight plays, the Ducks get two holding and an offensive pass interference penalty. In this situation tight end Kano Dillon is flagged for pushing off a defender to allow him to catch a nine-yard pass. Oregon has been much better cutting down penalties this year compared to last season, but this game was one of the worse by the Ducks this season. Dillon doesn’t do more than many receivers do (pushing off), but when you do, you must be closer to the defender and not allow your arm to fully extend on the push, which makes the infraction hard to miss by the referee. Oregon was flagged for 63 yards, and that does not include lost yardage (18 yards) on this play that drew the penalty. This is unacceptable for a team on the road in the Pac-12 and usually results in defeat to a good football team such as Utah. Utah’s punter gets a bit greedy in this situation, taking two extra steps to his right before getting the kick off. His protective blocking shield is moving to protect him to the right, but Dillon makes amends for his penalty by slithering through the shield to block the punt. This should never happen with this particular punt formation, but the kicker’s decision to take extra steps before kicking to allow his coverage more time to get downfield and Dillon’s extra effort on the rush results in a great momentum shift that turns the game around, at least for 1:27. Dillon’s blocked punt gives the Ducks the ball on the three-yard line with a chance to take the lead in the game. Herbert rolls to his left with running back Travis Dye isolated on an inside linebacker man-to-man. It is a difficult proposition because the linebacker is more accustomed to defending plays inside. Dye takes off to the flat and the linebacker cannot make up for the yardage between them and Herbert throws the go-ahead touchdown. 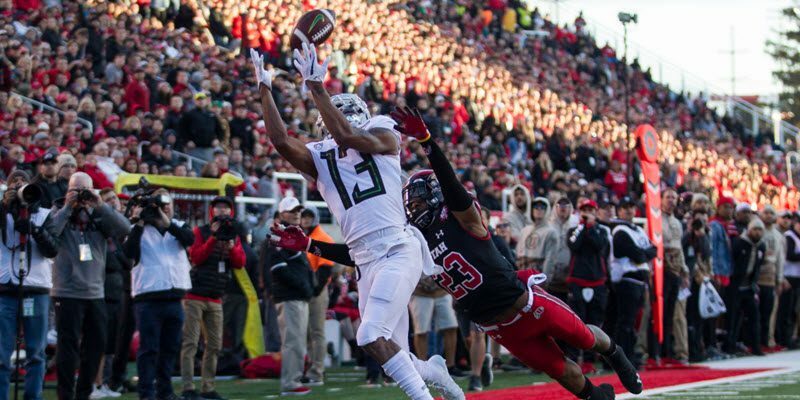 It’s at this point that Oregon’s defense needs to bull its neck and shut down Utah, but it does not happen. After holding the Utes to just three points in the second half, the Ducks’ defense collapses, giving up a five-play, 60-yard drive in a minute-and-a-half. Oregon is then behind for good, 29-25. A battered Oregon football team gets back to the friendly confines of Autzen Stadium in the role of spoiler this weekend. With their own chances of competing for the Northern Division title gone, the Ducks have an opportunity of knocking off the Arizona State Sun Devils and ruining their chances of a Southern Division crown. Injuries have mounted for Coach Cristobal’s squad in the position where the Ducks were always, even out of spring ball, thin on experienced players: linebacker. On the other hand, the deep experience the offensive line boasted of has gradually eroded to the point that first-year freshmen are starting for injured regulars that represented a great deal of playing time. The situation shows that the poor management of recruiting by previous head coaches before Cristobal is evidence that in college football, unlike college basketball, it takes several years to accumulate the right amount of talent and experience to successfully compete in the Pac-12 Conference. The Ducks were never at that level this year and as time and injuries have mounted, it is clear there is still a lot of work, and retention of good players, necessary before Oregon is a conference contender again.